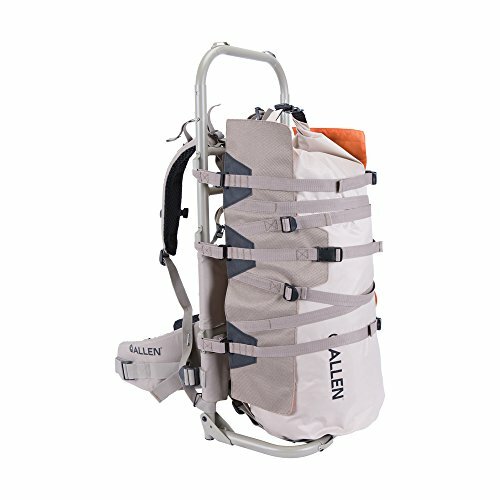 The Rock Canyon CP External Pack Frame from Allen is a lightweight, yet heavy-duty, sturdy aluminum frame that allows you to pack out your gear or harvest with ease. The frame itself is adjustable from 33" to 36" for increased load capacity, and the reversible compression panels quickly adjust based on load size and can be used with the blaze orange side or the Tan side out. The bottom folding shelf gives you extra support when needed but folds flat for easy storage, and the exterior lashing points quickly secure heavy loads. The contoured frame rests naturally on your back, and the dense foam padded waist belt and shoulder straps with cool mesh backing, plus the chest strap, help keep you comfortable. The pack also features a mesh back support panel for added stability. A 50L waterproof roll-top dry bag with a flat bottom is included to keep your gear dry. You can also attach extra gear as needed to the shoulder with the MOLLE web straps and D-rings. Mustad MB014 Zipper Boat Bag, 18"